Our e-series ballasts no longer require a switchboard to be switched on and off and no longer need their own switch to dim or boost them. Now you can just touch a few buttons on your controller to be in complete control of all your connected ballasts at once. Our Master controllers do this, and much more! 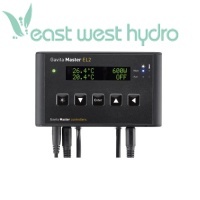 Switch, Dim or Boost Control 40 Lights/Ballasts in one room or 40 ballasts total with the Gavita Master Controller EL1. Can dim lights to compensate for temperature spikes, can control light cycles, and give you option to have sunrise and sunsets. 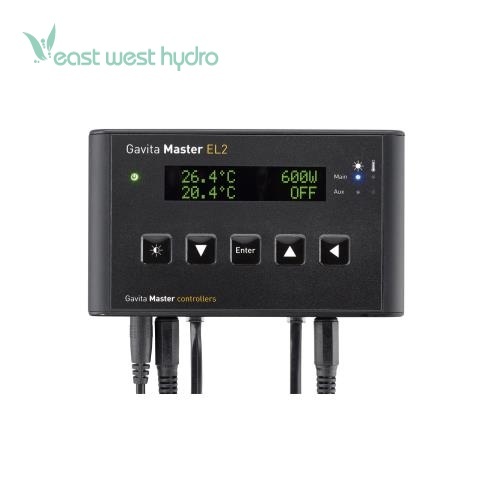 The Gavita EL controller series includes two models: the EL1, and EL2. Both feature auto-dim, auto-shutdown, sunrise/sunset and timer. The EL1 has one output channel, while the EL2 has 2 output channels and additional outputs for External Contactor Modules and alarm contacts. For one room without auxiliary equipment or alarm contacts, the EL1 is the best choice for you. If you require switched auxiliary equipment during lights on/off, alarm contacts and/or a 2 room 12/12 setup, the EL2 is most suitable. Dimensions: 5in. × 1in. × 2.95in.